What type of day are we looking to have? That’s the first question you should ask yourself before you get in the car to come visit us at Freedom Boat Club. You might be thinking that, that’s definitely not the first thing you should ask yourself. Instead, you should be concentrating on what you should bring boating and figuring out the math on how early you should leave to beat traffic. The reason that you should ask, ‘what type of day are we looking to have?,’ is because the question will help determine what type of boat you should take out for the day. Each of our boats have many benefits to them, but it all comes down to what type of day you want to have with your friends or family. For example, if you’re looking for more of a day lazing around Lake Lanier at our boating club, then you need a specific type of boat. The type of boat will help dictate what type of day you’ll have and what you’re looking to get done or not get done in your day. At Freedom Boat Club, we offer two types of boats: pontoon boats and speed boats. As an affordable alternative to boat ownership in Buford, GA, we’re able to provide a fun day of boating for you and your family or friends while staying within your means. To learn more about some of our boats below, continue reading our blog. As we mentioned above, we offer two types of boats you’re able to take out at Freedom Boat Club. Each of our boats have many benefits to them and it depends on the type of day you want to have to figure out which boat would be best for your boating excursion. Before you pick out a boat for your day, ask yourself a few questions before you make your final decision. Are you looking to have a relaxing day? Are you looking to enjoy some water activities? How many people do you want to come with you? Do you want your four-legged furry friend to come too? Do you want to fish or do you want a high energy day? Some of these questions are just the beginning of how to make your final decision on a boat. As an alternative to boat ownership, you’re able to take out any type of boat you wish with no additional fee. The major benefit of our boating club is that you’re able to take out any boat you wish to spend the day on without needing to do anything extra. Instead of battling with winterizing your boat, keeping it in storage, and carting it from the lake and back, you’ll be able to show up with your gear, the company you want to keep, and ready to take out the boat where you’ll have the most fun. Now that you’ve figured out what type of day you want to have, it’s time to figure out what boat best fits the day you have planned out. Below you can compare and contrast the speed boat versus the pontoon boat and the many features each bring to the water. The speed boat is one of the most fun types of boats. Whether you’re taking out our Sea Ray Cruiser or the Discovery speed boat, you’re able to enjoy a speed boating adventure on Lake Lanier. Our speed boats are spacious yet cozy and can hold on average about six people. The speed boat can offer you a few things when you go out. First, you can expect a high energy day with lots of fun activities. Second, you can expect water activities you aren’t able to do on the pontoon boat. Third, everyone’s going to have a little fun in the sun while staying cool with the periodic splashes of water. Depending on the speed boat you take out, it can hold about four to eight people. All of our speed boats are built for comfort and family recreation. Wakeboarders will enjoy taking any of our speed boats out due to the wakeboard tower. Go as fast as you want for water skiing to water tubing. All of our speed boats are sporty and enjoyable. Our speed boats can hold a large tank of gas so you don’t have to repeatedly fill up. Some of our speed boats have cabins for overnight stays. 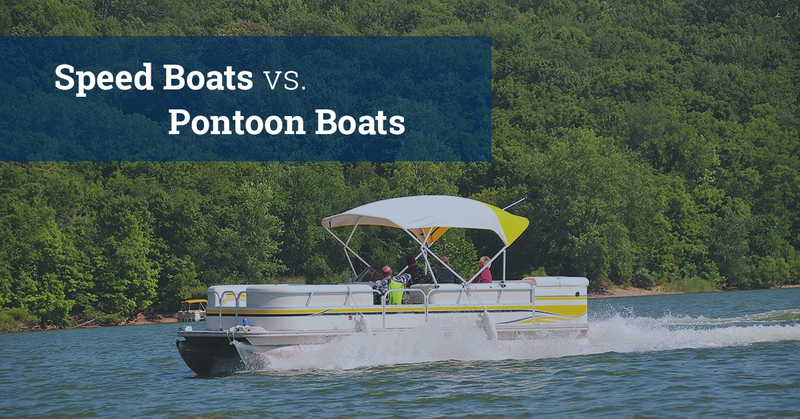 Unlike the speed boat, pontoon boats are able to afford you much more of a flexible day. While having more room than speed boats, the pontoon boat is able to give you the ability to have a relaxing afternoon while firing up the boat in the morning. Instead of spending a high energy day on Lake Lanier, you can go with the flow on our pontoon boats. Pontoon boats are roomier, with chaise lounges and are great for families, especially one’s with animals. Spend the day fishing, sunbathing, or exploring the coves on our pontoon boats. Depending on the pontoon boat you take out, it can hold 10 to 12 people. Don’t leave your furry, four-legged friend at home! We provide pet-friendly pontoon boats. You can spend time relaxing in one spot instead of speeding around Lake Lanier. Spend the day fishing with your friends or family members and catch some different types of fish. You’re able to cruise around the lake in the morning while relaxing in the afternoon. You are able to work on your tan while reading. Our pontoon boats are roomy and give you the ability to sunbathe and explore the coves. If either of these types of boats interest you, then you can always come visit us at Freedom Boat Club to take out one of these types of boats for a fun day in the sun.